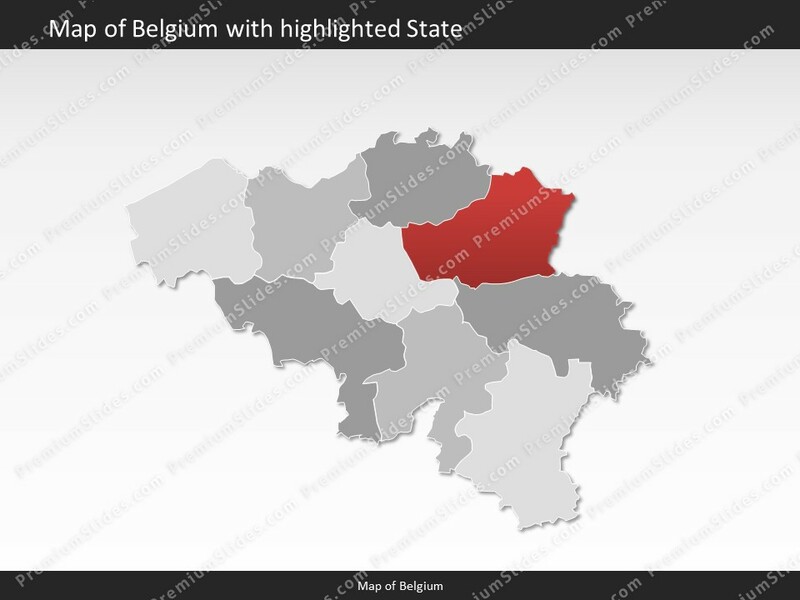 Premium PowerPoint Map of Belgium. 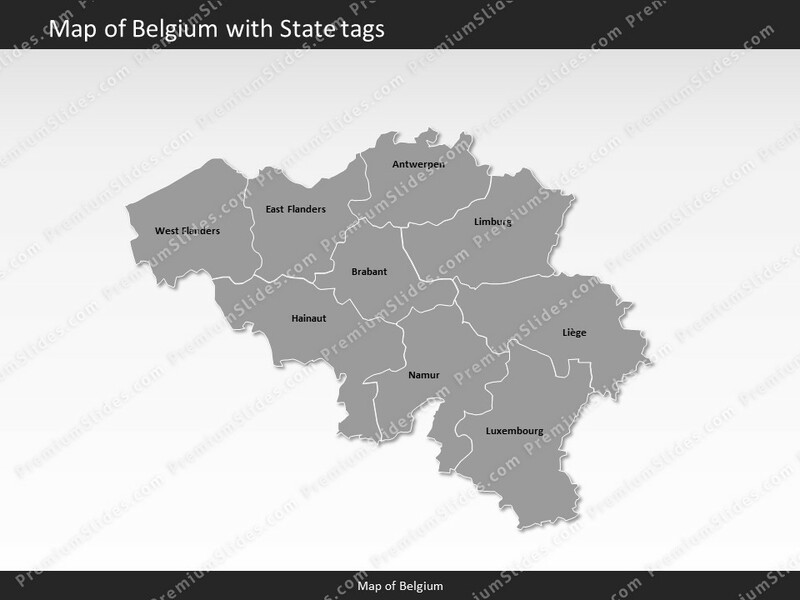 This detailed PowerPoint Map Template shows Belgium states, biggest cities and the Belgium state capital. 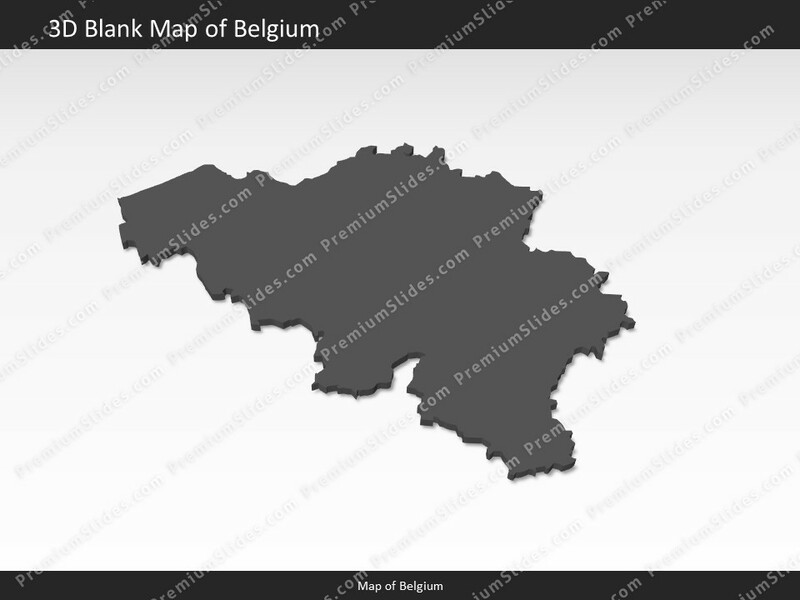 The Belgium PowerPoint Map is hand drawn and fully editable in size and color. 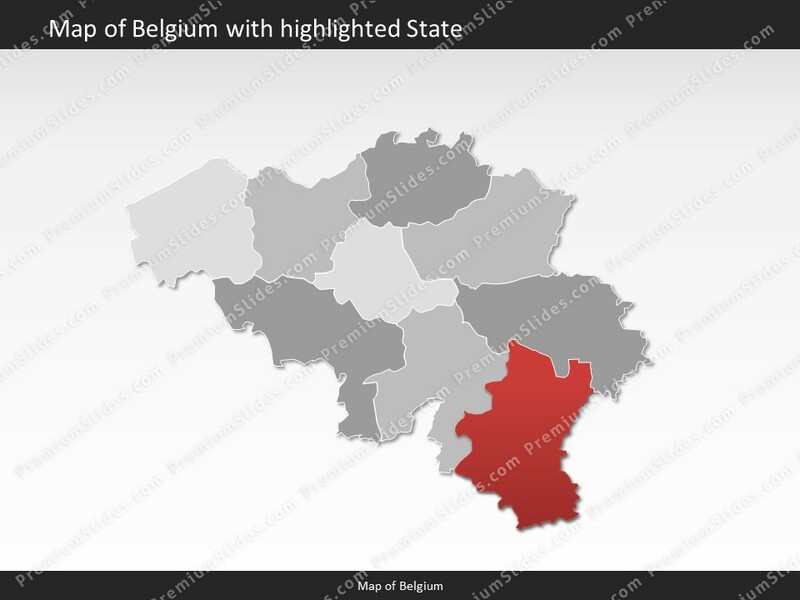 Premium PowerPoint Map of Belgium. This detailed PowerPoint Map Template shows Belgium with states names and biggest cities including the Belgium capital.The Belgium PowerPoint Map is hand drawn and fully editable in size and color. Every state can be extracted simply. Specific territories can be highlighted easily with just 2 clicks in PowerPoint. 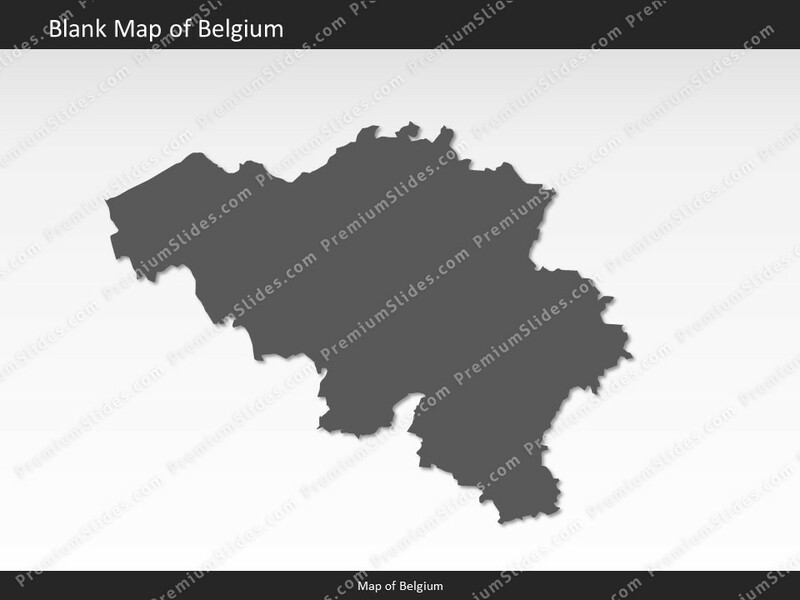 The extensive Map Guide, which is included in this package, shows the easy steps of adjusting the map to your needs.The Belgium Map Template is a great benefit for showing different kind of data (e.g. sales) in this country. 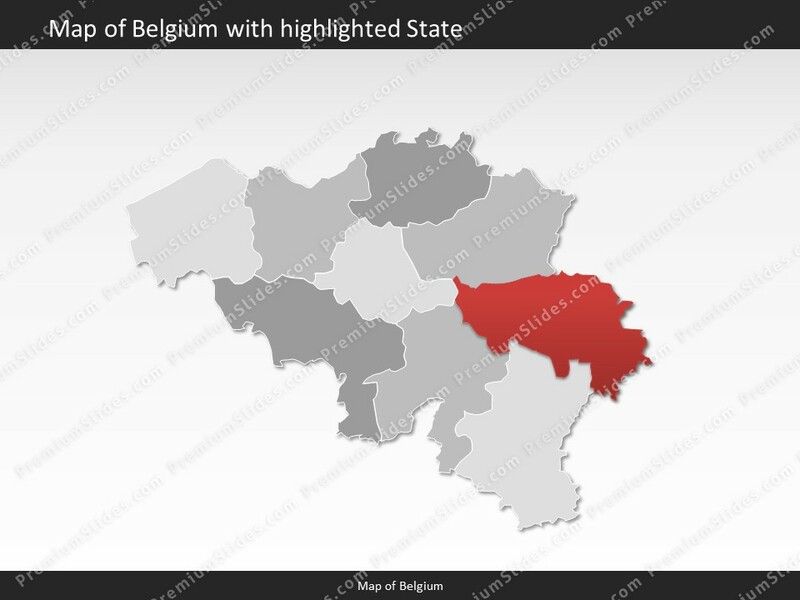 This Belgium PowerPoint Map comes in 8 different pre-designed colors and includes map marker icons as well. These very detailed PowerPoint maps are completely editable in size and color. Every single country, county or state (depending on the map) can be extracted or highlighted. Because of the excellent quality you can resize any map without loss of quality. This is significant if you want to print your PowerPoint Slides. There are up to 14 different color themes shipped with all this PremiumSlides map package. You can switch all colors of your map with just one simple click. This makes it painless to include maps in your own presentation. The colors have been selected to look great in combination. To making use of PremiumSlides Maps for PowerPoint you do not have to be a design expert to have great looking slides in your presentation. This PowerPoint map is delivered with state and capital name tags. All views are well structured. 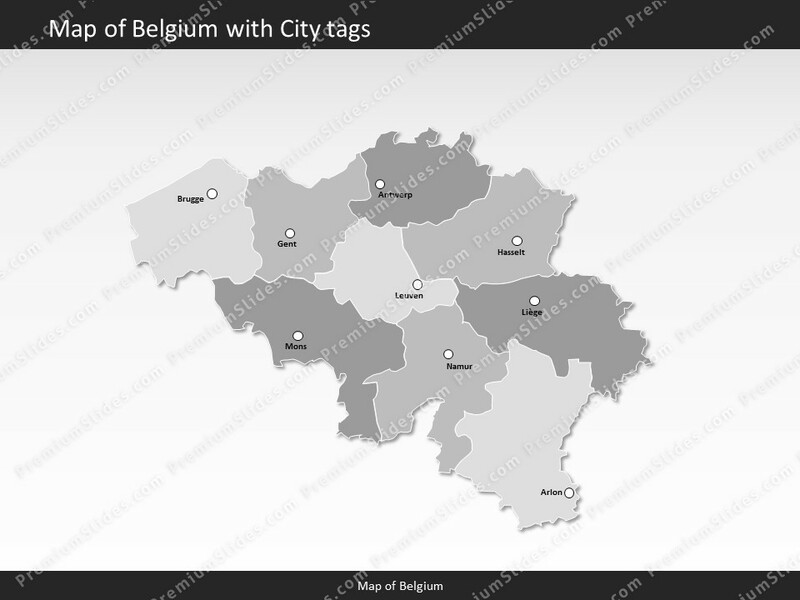 Country and city tags can be hidden with just one click if you prefer a blank map. We guarantee that all our products work with Microsoft Office newer than Office 2003. You can work with our maps and shapes not only in PowerPoint but likewise MS Word and MS Excel. All files even work on Office for Mac. Only the Selection list add on is not supported by Office for Mac. You do not need any new plugins or any other software! Just launch PowerPoint and work straight away. You can download your purchased map files and slides directly after purchase. 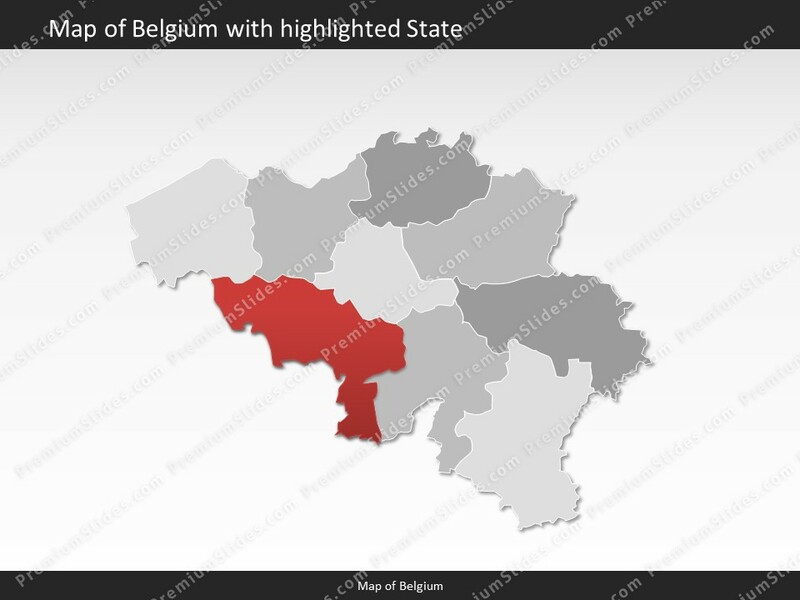 Facts and information about Belgium you can use in your presentation. 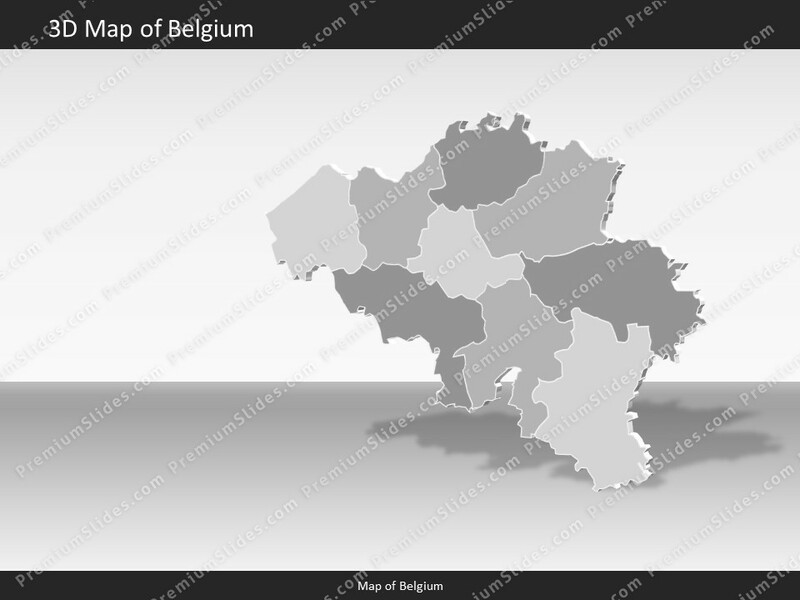 Belgium is often referred to as Kingdom of Belgium or simply Belgium. The locals also call the country Royaume de Belgique (French)/Koninkrijk Belgie (Dutch)/Koenigreich Belgien (German) or Belgique/Belgie/Belgien for short. The name derives from the Belgae, an ancient Celtic tribal confederation that inhabited an area between the English Channel and the west bank of the Rhine in the first centuries B.C. The country's flag has the colors red, black, yellow. The country of Belgium lies 50 50 north and 4 00 east. The region has a total area of 30,528 sq km with a land coverage of 30,278 sq km. About 250 sq km is covered with water. 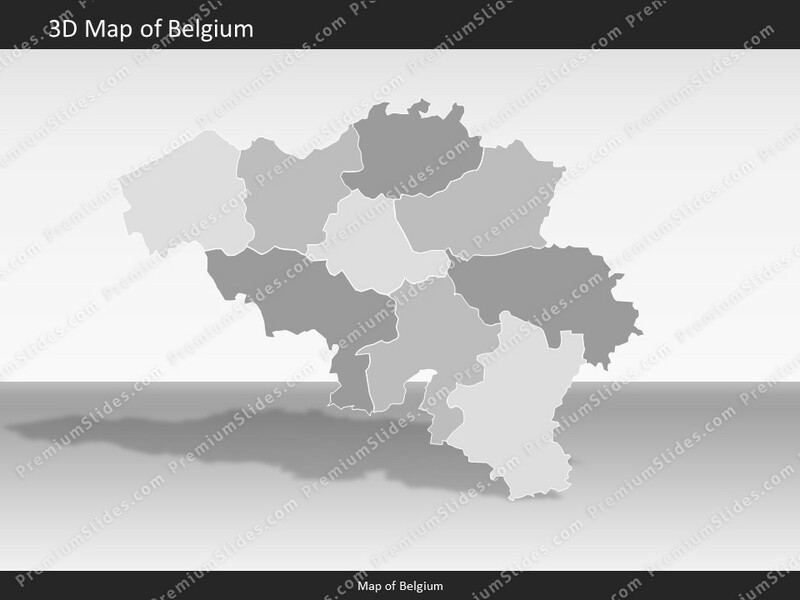 Belgium has a total border lenght of 1,297 km and is bordered by the following 4 countries: France 556 km, Germany 133 km, Luxembourg 130 km, Netherlands 478 km. 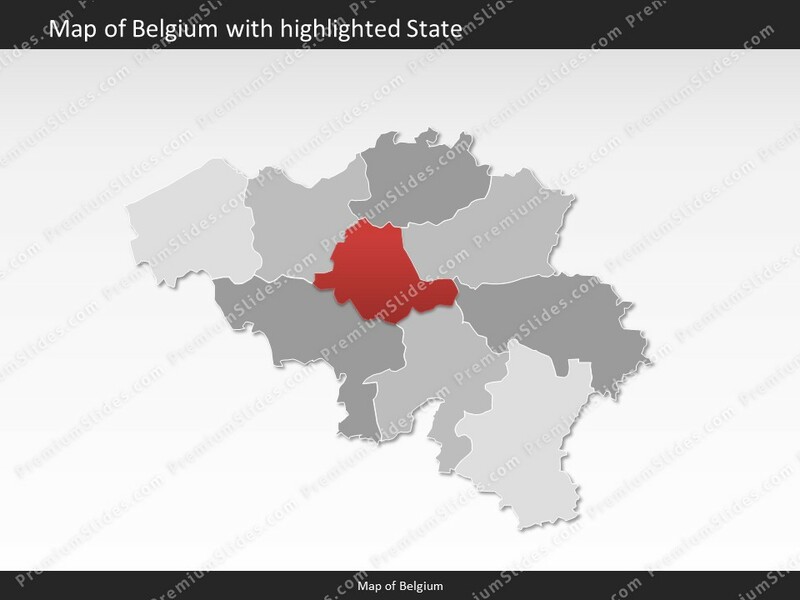 The lowest point is North Sea 0 m below sea level and the highest is Botrange 694 m. Its mean elevation is about 181 m. Brussels is the capital of Belgium and can be found 50 50 N, 4 20 E.
In July 2016 Belgium had a population of 11,409,077 people. In 2015, 97.9% of the population lived in cities. The annual growth rate of urbanization is 0.48%. 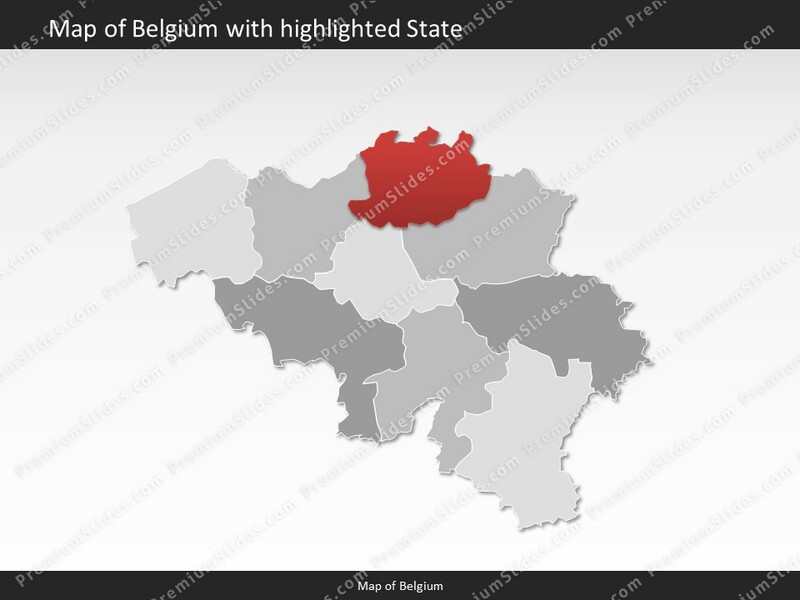 The residents of the country are called Belgian(s). The Belgian population has a median age of 41.4 years. The median age for males in 2016 was 40.2 years, and 42.7 years for females. 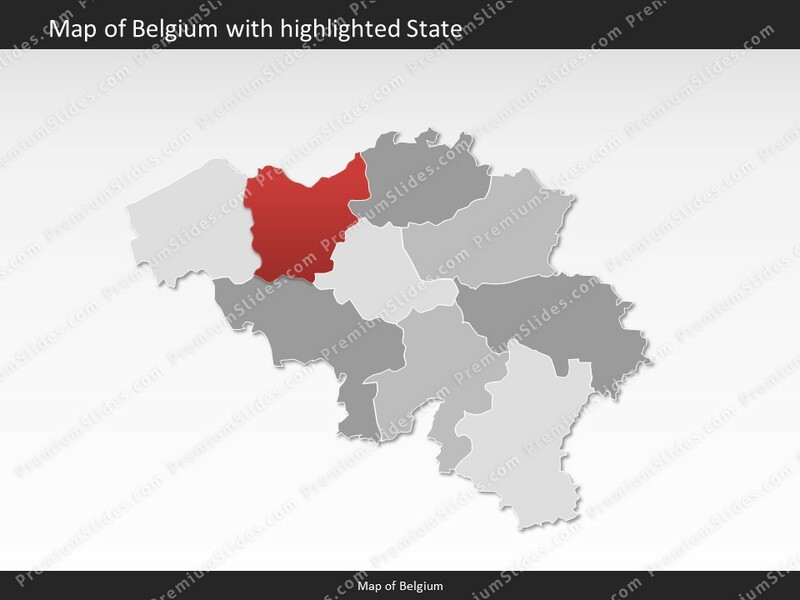 The estimated growth rate of the Belgian population in 2016 was 0.73%. Looking at life expectancy, the Belgian people live an average of 81 years (males 78.4 years, females 83.7 years). Statistically, Belgian women give birth to 1.78 children in their lifetime. The estimated gross domestic product in 2015 was about $494.1 billion, with a growth rate of 1.4% compared to 2014 (GPD 2014: $487.4 billion, growth rate 1.3%; GPD 2013: $481 billion, growth rate 0%). The economic sectors of Belgium are: agriculture: 0.7%, industry: 22.3% and services: 77% (2015 est.). The country's economy is known for: engineering and metal products, motor vehicle assembly, transportation equipment, scientific instruments, processed food and beverages, chemicals, base metals, textiles, glass, petroleum. 100% of the people living in Belgium had full access to electricity in 2016. Among those 85% (July 2015 est.) 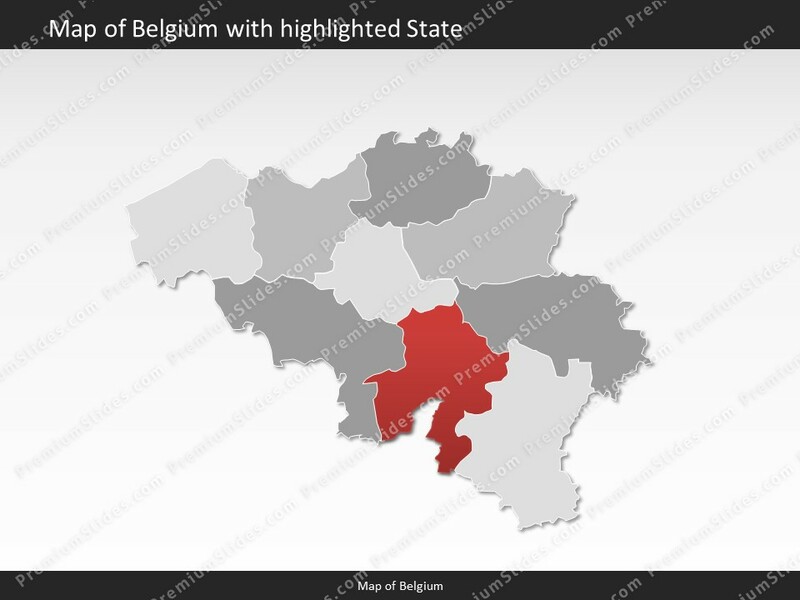 or 9.631 million Belgians, had access to an internet connection.